2. as a soup, the Goulash soup. The Goulash soup has become a traditional New years Eve soup, served shortly after mid night. The Goulash soup can be spiced to taste with more or less Cayenne pepper or completely without and only with Hungarian Paprika powder. 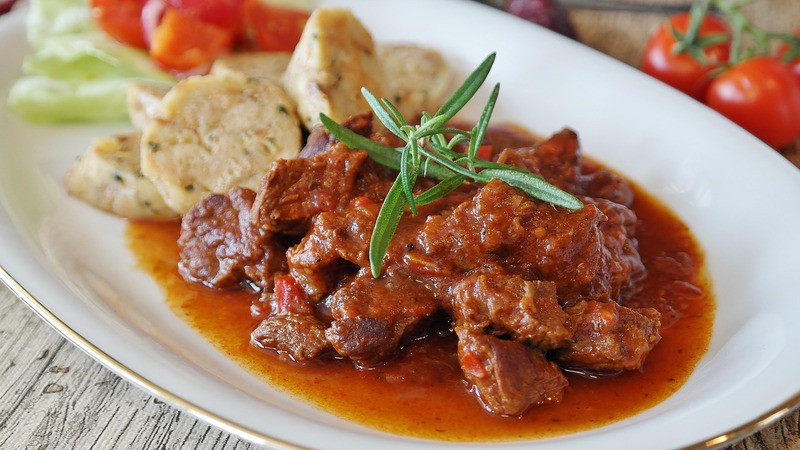 When cooked right the beef for goulash and/or soup should be very tender. Happy Cooking! - Peel onions and garlic; chop both fine. 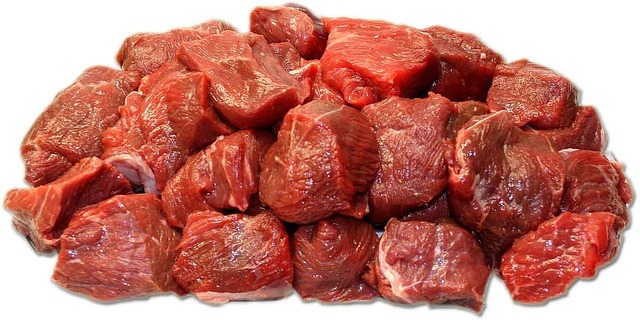 - Wash the meat and cut it into cubes if it is not already cut. Dry on kitchen paper. - Cut bacon/speck into very small cubes. - Heat oil in a big enough pan. - Add onions and bacon (if you use it), and saute for 2 minutes on high heat. - The meat should be added in small portions; brown it slightly and evenly from all sides, spice with salt, pepper and paprika. - Dust the meat with some flour. - Add red wine and let cook for 3-5 minutes. - Fill up with water until the meat is covered. - Let cook on low heat for 1.5-2 hours, cooking time depends on the meat quality and how big the beef cubes are. The first 90 minutes with a lid, the remaining 30 minutes without. - Dissolve cornstarch in a little bit of water and add to the sauce. The sauce should be thickened. 30 min before the meat is done add sliced mushrooms. Add carrots (sliced) and potatoes in cubes. If you like a lighter and more creamy sauce add some heavy cream at the end. - Red cabbage, and /or seasonal vegetable and a salad.